ractal cross stitch patterns are one of the hottest trends in cross stitch! What is a "fractal"? Fractals are digital art created based on complex mathematical equations. That sounds complicated but the end result is very beautiful, colorful and unique art. StitchX transforms this digital art into cross stitch patterns that are truly works of art when completed. 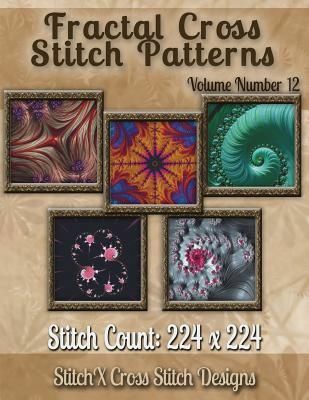 This beautiful collection includes five complete fractal cross stitch designs. All stitches are full cross stitches. There is no fractional, blended, or backstitches. The designs are solidly stitched for exquisite detail. Charts are in large, easy to read black and white symbols. Our books also include a DMC "shopping list" indicating how many of each floss skein needed. StitchX also includes a Project Planning sheet in each book to help you plan your fabric size as well as hints and tips for stitching large designs. New! Now included is a page layout guide as well. Dimensions are the same for all of the patterns in this book. This is number 12 in our Fractal Cross Stitch Pattern collection books.